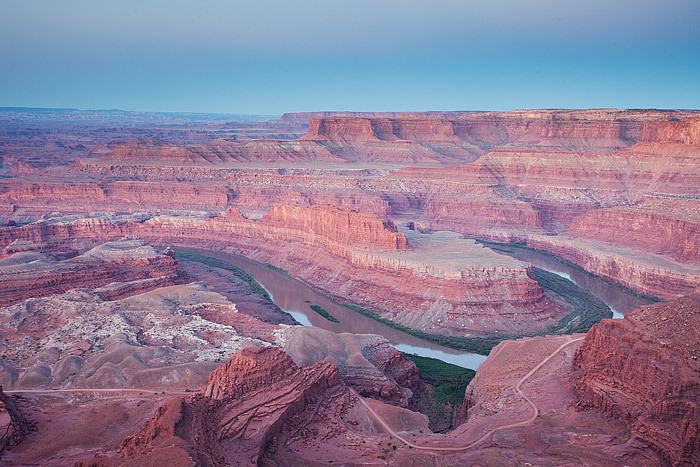 Daybreak is quickly approaching the red rocks of Canyonlands and the Colorado River. The shadow of the earth can be seen receeding into the sky as daybreak looms over the Colorado Plateau this beautiful morning. This impressive view of the goosenecks of the Colorado River is from Dead Horse Point State Park. The view from Utah's Dead Horse Point State Park is an impressive one of the Colorado River and Canyonlands National Park below and beyond. Photo © copyright by Thomas Mangan.